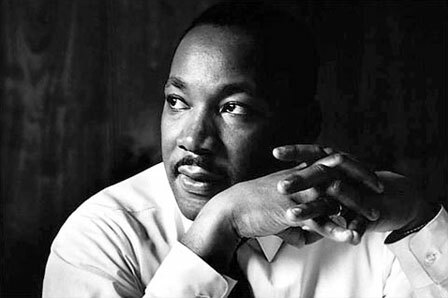 Surprisingly, through all the talk about MLK we've heard today, there's one aspect of Dr. Martin Luther King Jr. we aren't hearing that much about: the fact that he was a Christian. Yes, believe it or not, he had that "Dr." at the beginning of his name because he had a doctorate in theology. Yes, he spent some time leading civil rights protests, but he spent much more time being a preacher. Okay, maybe you knew that part. But what we really don't hear about often is that King's Christianity was rooted in his personal spiritual experience. When discussing his spirituality, people usually say King was influenced by Christ's or Gandhi's "philosophy" -- as if, based on a sober assessment of their logic and evidence, King concluded their ideas were sound -- but they don't touch on what King saw as his firsthand encounter with the divine. I've read and listened to a lot about King, but I only recently heard this story. One night in 1956, King's struggle was taking its toll, and he was feeling tired and defeated. Sitting at his kitchen table, he started praying out loud. Suddenly, he "experienced the presence of the Divine as I had never experienced Him before." "It seemed as though," he wrote in Stride Toward Freedom, "I could hear the quiet assurance of an inner voice saying: 'Stand up for righteousness, stand up for truth; and God will be at your side forever.' Almost at once my fears began to go. My uncertainty disappeared. I was ready to face anything." This experience convinced him to stay on his course, and become the leader he became. When reading about this event, it struck me that this would be a great story to tell the people I know and read who scoff at spiritual practice, and say it's a waste of time. "Why spend all that time meditating or praying? Why not go out and do some good in the real world?" they ask. Here's a controversial thought: what if the very idea of "goodness" has its roots in spiritual experiences like King's? In other words, what if we wouldn't even have any sense of what it means to "do good," without the guidance of people who have had personal encounters with divinity? The founders of the great religious traditions -- Jesus, Buddha, Muhammad, and so on -- are all said to have had life-changing shifts in their consciousness that convinced them of their calling. These figures' spiritual experiences inspired the teachings and behavior they brought into the world, which in turn created much of what we now call "morality" and "ethics." At least, so some say. And how about another crazy idea: what if the very purpose of spiritual practice -- meditation, prayer, chanting, and so on -- is to bring about that same state of consciousness? To give the everyday person access to the compassion, inner strength, and sense of universal interconnectedness that drove people like King to accomplish what they did? If spiritual practice can do that for us -- and, in the interest of full disclosure, I believe it can -- I think it's actually one of the best uses we can make of our time.